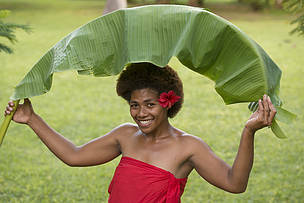 An archipelago of 332 islands in the sun, Fiji, the isles of ‘bula’ smiles sits at the crossroads of the Pacific. Clothed in sprawling forests of green, vibrant waterways streaming down lofty peaks into lush valleys, the volcanic islands of Fiji are fringed by spectacular beaches and clear azure waters. A nation of color, culture and diversity, Fiji’s natural blessings are her inhabitants, from a diversity of wildlife to the friendly people. 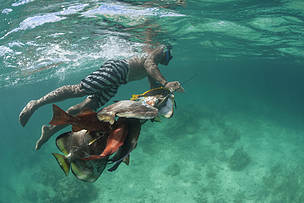 Home to the third longest barrier reef system in the Southern Hemisphere, the Great Sea Reef and a priority focus for WWF, whether on land or at sea, Fiji’s biodiversity is remarkable. Fiji boasts the richest avifauna (bird species) in Western Polynesia, and home to endemic living animal treasures. The Collared Lory, Crimson shining parrots and the Orange Dove are just some of the 25 bird species endemic to Fiji. The monkey-faced bat is only found in Fiji along with the Fiji Crested Brachylophus vitiensis and Banded iguanas Brachylophus bulabula. This island nation of forest and coastal peoples is divided into fourteen provinces. WWF-Pacific works in four of these provinces, Bua, Macuata, Ba and Ra engaging communities in sustainable resource management. We also work with other stakeholders in natural resource extraction like the tourism, fisheries, government and corporate sector. Fiji’s Dry Tropical Forests and Tropical Moist Forest ecoregions is part of the Polynesia-Micronesia biodiversity hot spot. 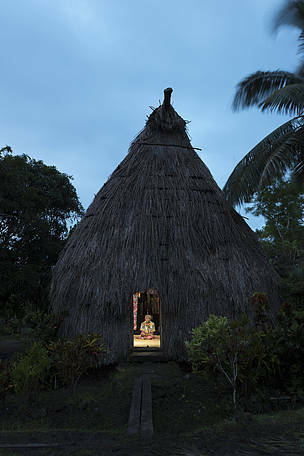 Fiji's architectural heritage, a bure, on Mali island where WWF-Pacific works with islanders to strengthen the protection of marine protected areas. An innovative programme focussed on transforming the seafood supply sector, working with a variety of partners along the seafood supply chain to build a firm foudantion for sustainable fisheries. At the community level we engage communities in adopting sustainable fishing practices, exploring value adding of marine resources and promoting the adoption of alternative sources of income to give marine resources a chance to replenish stocks. We also work with major hoteliers, encouraging sustainable seafood menus and with the Fiji Government in employing certification standards for seafood sourcing. Food security for Fijians through a sustainable seafood supply and the reduction of poverty are the main drivers of this programme flagging the concept that sustainable fisheries promote these. Fiji’s largest reef system, the Great Sea Reef supplies as much as 80% of fish sustaining the domestic fisheries industry, employing hundreds and supporting the livelihoods of as many as 70,000 people living in coastal communities along the length o the reef system. Offering as well recreational pleasures to the tourism sector, the GSR is a strong pillar bolstering the national economy. Protecting this reef system is therefore crucial. The programme looks at practical and transformational ways of affording the GSR protetion, employing a ridge to reef approach, from sustainable landuse practices, influencing green lending policies, and working with the Fijian government for legal protection of this important reef system. 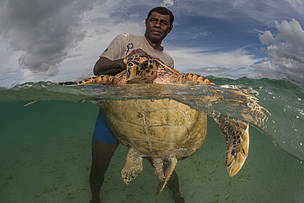 Five of the seven known species of turtles migrate through Fiji waters. These ancient wanderers forage and feed and nest in several islands especially along the Great Sea Reef. Since 2010, WWF-Pacific has built a strong network of community based turtle monitors, who were one time hunters of this iconic creature. We are trialling district level qoliqoli management with the people of Mali district in Macuata with the financial support of the Australian Government’s Fiji Community Development Programme. The essence of this programme includes empowering residents of Mali district especially in the four villages Ligaulevu, Vesi, Matailabasa, Nakawaga with the setup of proper governance structures, knowledge of business skills, income management and alternative livelihood sources to alleviate the pressure sustained on marine resources. 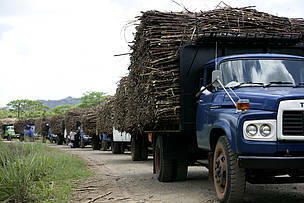 We are working with cane farmers in Labasa, north of Fiji on Vanua Levu to set up model cane farms that adopt best farming practices that reduces chemical and soil runoffs, absorbed by rivers and creeks that wind their way down to sea. These runoffs are seen to be causing harm to reef systems especially the Great Sea Reef. Lessons from these model farms will be shared across the 3,000 strong cane farming community. 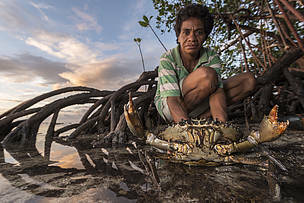 The extraction of natural resources is the main source of livelihoods for more than 70,000 families living in coastal communities along the Great Sea Reef. Turtle monitors rose from communities that feasted on turtle meat. One time turtle hunters, turtle monitors or Daunivonu were transformed by awareness highlighting the plight of this vulnerable creature. They now advocate for turtle conservation, to the point of sharing the turtle 'gospel' with kin and friends alike.